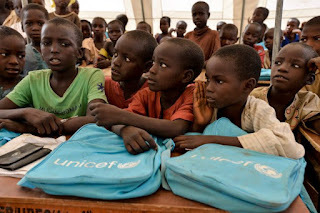 UNICEF on Monday appealed for $3.6 billion to provide lifesaving humanitarian assistance to 48 million children living through conflict, natural disasters and other emergencies in 51 countries in 2018. Hinds said that conflicts that have endured for years – such as those in the Democratic Republic of Congo, Iraq, Nigeria, South Sudan, Syria and Yemen, among other countries – continued to deepen in complexity, bringing new waves of violence, displacement and disruption to children’s lives. “Children cannot wait for wars to be brought to an end, with crises threatening the immediate survival and long term future of children and young people on a catastrophic scale,” said Manuel Fontaine, UNICEF Director of Emergency Programmes. “Children are the most vulnerable when conflict or disaster causes the collapse of essential services such as healthcare, water and sanitation. Unless the international community takes urgent action to protect and provide life-saving assistance to these children, they face an increasingly bleak future,” the director said. The statement said parties to conflicts were showing a blatant disregard for the lives of children. “Children are not only coming under direct attack, but also are being denied basic services as schools, hospitals and civilian infrastructure are damaged or destroyed. “Approximately 84 per cent ($3.015 billion) of the 2018 funding appeal is for work in countries affected by humanitarian crises borne of violence and conflict. “The world is becoming a more dangerous place for many children, with almost one in four children now living in a country affected by conflict or disaster. For too many of these children, daily life is a nightmare,” Fontaine said. The spread of water-borne diseases is one of the greatest threats to children’s lives in crises, the statement added. “117 million people living through emergencies lack access to safe water and in many countries affected by conflict, more children die from diseases caused by unclean water and poor sanitation than from direct violence,” said Fontaine. “Without access to safe water and sanitation, children fall ill, and are often unable to be treated as hospitals and health centres either do not function or are overcrowded. Working with partners and with the support of donors, in 2018 UNICEF aims to provide 35.7 million people with access to safe water and reach 8.9 million children with formal or non-formal basic education. The UN agency for children also plans to immunise 10 million children against measles; provide psychosocial support to over 3.9 million children and treat 4.2 million children with severe acute malnutrition.